I must have a pillow when I go to sleep. Call it what you will, but I need it. I am typically a side sleeper, but usually I initially lay on my back until I begin drifting off and then roll over on my side. This is where a pillow really comes into play. If I were to lay on my back all night (or my stomach) I could probably make do without one, but not on my side. When I began backpacking I bought some of the Kelty Camp Pillows to carry with me on my hiking trips. They were fine and I made do with them, however when they were packed, they were about the size of a 1 liter Nalgene (huge for a pillow). Also, they weigh 10 oz each; heavy. The nice things about these pillows though were that they were real pillows, only smaller. So, after a while I decided I would try something else, preferably smaller and lighter when packed. What I ended up with is the Exped Air Pillow. I ordered one from REI for about $30. I had read lots of great reviews about this pillow with lots of focus on the small packed size and the light-weight but still quite functional. When the pillow arrived, I was immediately impressed with the size and weight. It was of course stuffed and it was tiny. When compared to my Kelty pillows, there was no comparison. Over the course of time I had been replacing some of my gear with smaller and lighter gear so this pillow fit right in. One of the first trips I carried this pillow on was an overnight trip to Mt. LeConte in which my goal was to go as light and small as I could with what I had (and I did with a 25 L pack and an overall weight of 14 lbs). I used the Exped Air Pillow that night in the Mt LeConte shelter with the NeoAir and that night I experienced the best night of outdoor sleep that I had yet experienced. The pillow worked great. While on that trip, some buddies and I stopped in a the NOC in Gatlinburg and browsed around. Here I came across the Cocoon Ultralight Air-Core pillow. Now this was another pillow that I had considered when I got my Exped Air Pillow, but choose not to get it at that time, however, I did talk one of my buddies into getting one. Recently on another hiking trip to the Smokies I stopped in at the NOC again. As I was walking back through I again came across the Cocoon pillows. This time I decided I would try one out. I picked one up and alternated the Exped and the Cocoon over the next 4 nights while in the back country.What I found is that the Cocoon is quite a comfy pillow as well, and packs down to practically the same size as the Exped and less than an ounce heavier. Brimming with light, soft support, this inflatable pillow offers the ultimate in packable comfort. Just the right design for sleeping comfort, the asymmetrical Exped Air Pillow provides comfortable head support for side and back sleepers. Packs down to a compact travel size of 2.2 x 4.7 in. SHAPE: The Exped pillow is a contoured pillow which is designed to be used in multiple positions. There is a curve in the top and bottom edges of the pillow which makes it nice for when I am laying on my side. My shoulder will fit right into the curve so that I can take full advantage of the pillow, and it feels like the pillow is actually hugging my head and neck. Also, the pillow is sloped from one end to the other, which offers two different heights to choose from. I have found that I enjoy the taller end, especially when I am laying on my side. Lastly, the pillow has somewhat of an indention in the middle. This indention helps the pillow to form around my head when I am laying on it, and more specifically when I am laying on my back. The Cocoon pillow is more of a traditionally cut pillow. It is simply rectangular, however, it too has two indention’s which can be felt when the pillow is inflated but not seen. These indention’s work the same as on the Exped in that it helps to cradle my head and to help keep the pillow centered under my head. As far as the cut, just because it is not shaped fancy doesn’t mean it is a bad thing. I love the feel of a rectangular pillow. When I gave up my Kelty pillows I must say that I found myself missing this simple design (this is not to say that I did not find the Exped any less comfortable, just different from what I was used to). COMFORT: I did have a little concern about an air-filled pillow and if it could be comfortable. I imagined laying on a plastic bag filled taut with air. However, as soon as I laid down on the Exped Air Pillow, I found that this simply was not the case. First off, the pillow can be filled with however much air that I want to make it as firm as I want. Secondly, the texture of the tricot polyester on the Exped pillow is very soft and comfortable and even stretches. This pillow definitely does not feel like an air-filled plastic bag, but rather a pillow that has been given the needed attention to make a plush yet firm air pillow. The Cocoon pillow has also proven its worth as far as comfort is concerned. In my opinion, the biggest secret to the comfort is the traditional rectangular cut. It just feels right. But that doesn’t mean that the pillow has other means of providing comfort. The Cocoon pillow offers two different textures, a microfiber shell on one side which is warm and cozy feeling similar to that of a pillow case on my real pillow and on the other side a sleek, smooth nylon ripstop for those hot summer nights when I need a cool feeling place to rest my head. Also, the same as with the Exped, this pillow can be filled with as much air is needed to make the pillow as firm as I need it to be. SIZE: With both the Exped and the Cocoon pillows, the both pack down super tiny to the point that I can actually lose it inside my backpack, and as bad as losing things are, this is one of those times that it is a good thing. As far as size when inflated, they are large enough to do the job, but not excessively so. It would be super nice to have a larger size pillow at night, but I know that there is no way I could do so at this weight and size. And since they do indeed do the job for me I cannot complain. WEIGHT: This one is simple. Both of these pillows are super light, at least when compared to my Kelty pillows. At less than 4 oz for either of them, one of the two will always find its way inside my pack for any over night trip. At this point, it is hard for me to say that I definitely like one of them better than the other. I have experienced a great nights sleep on both of them. In all actuality, the biggest problem I have with either of them is keeping them in the right spot at night while I sleep. The Cocoon will slip and slide around if the smooth nylon ripstop side is facing down. The material on the Exped offers a better hold on my pads, but at the same time, this pillow is just as capable of squirting out from under my head as the other. I will say that the Exped has two loops at the bottom which is supposed to allow the pillow to be tied off to the Exped pads, but I have not done this. The problem with this is that if I were to tie the pillow off to the pad, it would need to lay down in front of the air pad rather than on top of it. If I did this, it would definitely not be tall enough. I have tried putting the pillow inside my hood on my sleeping bag, but this is not always the best idea. The pillow can still easily slip out of the hood, and if the hood is cinched closed around me, there is not enough room inside the hood for both the pillow and my head, at least comfortably. However, on my last trip I figured out a way to hold my pillow in place. To do so simply requires a shirt. 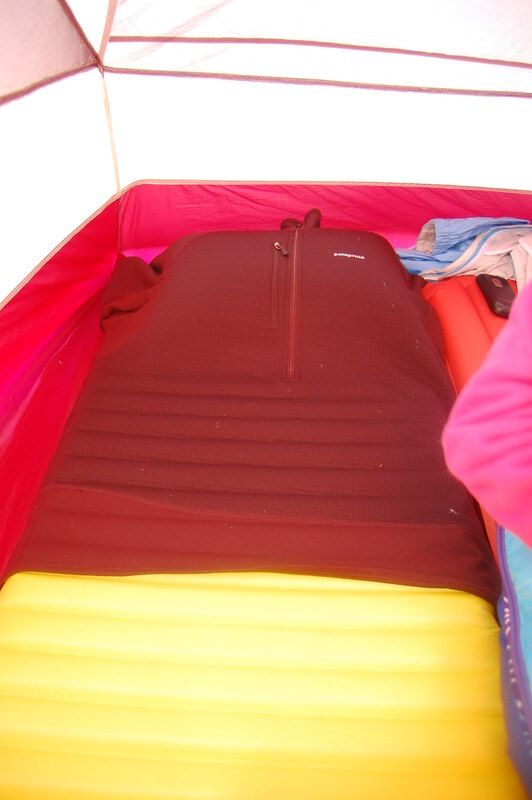 What I did on the last trip is I took my R1 and basically dressed the top portion of my NeoAir. I pulled the shirt over it like it was wearing it. Then I simply shoved my pillow under the shirt and on top of the pad. Then when I laid down on the pad I also laid on the bottom of the shirt sealing off the shirt. Then the pillow stayed in place no matter how I laid or turned. Here is a picture: So, as far as which one is better, in the end I cannot say. I can just say that they are both great pillows. They both packs small, both weigh hardly nothing and they both provide a good nights rest. I am happy to have them both. This entry was posted in Gear, Pillows and tagged Backpacking, Cocoon Ultralight Air Core Pillow, Exped Air Pillow, Gatlinburg, Hiking, Kelty Camp Pillow, Mt LeConte, NeoAir, NOC, pillow, REI, Smokies. Bookmark the permalink. Okay, I realize this post was nearly 4 years ago but it was pretty well written. Now I have to ask you, 4 years later, which one is the champ? Or were both of them replaced by a new contender? Thanks for a great detailed review. I was looking around for a honest review because I came across a few who whined about it breaking down so it sounds like you got some experience with them on the trail. Can you fess up with the champ? Thanks for responding. I will look for the write up on the new pillow. I was curious if you found something better and it sounds like it. Looking forward to reading it. With the Exped mats (Downmat and Synmat anyway, I’m not familiar with the others) you can tie off the top of the pillow to the mat instead of the bottom so that the pillow is on the mat instead of above it… that sounds a little convoluted. Place your pillow on the ground above your sleeping mat, but have it upside down. Strap the two together in that position, leaving a little slack, and then flip the pillow over onto your mat. It has a little play, but it’s not going to go sliding off the mat in the night. Actually, that was part of the reason I bought the Exped Air Pillow, because it could be attached to the mat. And as soon as I received the pillow in the mail I inflated my mat and tried it out. It worked ok. But, shortly after I bought the NeoAir and since then I haven’t even considered the Exped. As far as the pillow, it is a nice pillow, but I must say that I have come to like the Cocoon pillow more. Simply for the fact that the Cocoon is more of a traditional shape and that works for me. But, the Exped still gets a fair share of use, between my wife, my son and a buddy that I loan stuff to, it gets used! I’m going to check out the Exped. Frankly, I think your best work here was dressing your sleeping pad. I’ve been wrapping my fleece around my “pillow” (a 1 oz. water wing for little kids who can’t swim, cut in half). Even without purchasing a bigger pillow this configuration could work great! DUDE, you have to pick one! Nice article. Man, I hear ya. They both are pretty nice though. It really is hard to decide. I will probably bring the Cocoon pillow with me for a while since it is still new. I will jsut have to see. Thats a great idea, putting the pillow in the jacket/fleece.I will try that out soon. Thanks, While I am sure that I am not the only one, let alone the first one, to do this, it was pure bliss when it dawned in me while on the trail. I guess the only problem would be if you are a tiny person and the shirt did not fit well over your pad. Lucky for me it fits perfect. Anyway, thanks for checking out the site and leaving a reply.